There's an 150 years old legend about "the reverend" (Michael Robert Brandon), who led a flock of people to the island to ... well, lead them, but was killed by his own followers. Since there have been legends that he has come back from the grave, but nothing big has been made of this since there are too many urban legends around to count anyways ... but last year, no less than 8 violent deaths has happened on the island, which is still inhabited by offspring of the reverend's flock mostly. So professor Moore (Skip Corris) has set out to investigate the whole story, and his preliminary findings prompted him to call in husband-and-wife documentary makers Ned (Nate Scholz) and Stacy (Jamie Bernadette) and their soundlady April (Erica Overholt) ... but after they only do a preliminary interview with the sheriff (Timothy Patrick Quill), the professor's found dead, killed (known to the audience but not the protagonists) by local psycho Lucas (Dan Hicks), who later also kills April. The whole thing is inexplicably covered up by the locals, and before too long Ned and Stacy find out there's something not only wrong here, but dangerously so - but have they found out in time to make their escape, and what's behind all the killings anways, it can't be the reverend ... now can it? 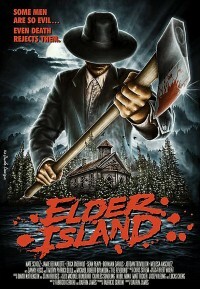 Now of course, whoever reads about the cult-on-an-island concept of this movie will naturally think of the classic The Wicker Man, and one can't blame them, but Elder Island stays pleasently far away from just replicating the shocks of old, rather tells its story as a piece of survival horror with a healthy amount of well-executed on-screen action and meanness, a very likeable or love-to-hateable cast of characters embodied by a very competent cast of actors, so as to keep the audience on the edge of their seats caring for them, and have them carry a by itself well structured story arc. To put it another way, it's a rather cool genre movie!! !